"Because heart disease, which “kills more people around the world than all the cancers combined,” is the primary threat to human health across the globe, it’s vital that researchers continue to develop new ways to fight and survive it. Spotlighting the efforts of a long series of medical trailblazers, Texas Monthly executive editor Swartz (co-author: Power Failure: The Inside Story of the Collapse of Enron, 2003) charts the evolution of cardiac technologies. The author focuses on the personalities responsible for these breakthroughs and examines four Texans in particular and how their work has radically altered the surgical success and survival rates of heart patients worldwide. Swartz profiles several enterprising physicians at the forefront of this movement who were spurred to act swiftly “because advances in treating and curing heart disease weren’t coming fast enough.” Among them are determined coronary pioneer Michael DeBakey, risk-taking surgeon Denton Cooley, surgeon and “innovation evangelist” Billy Cohn, and the Texas Heart Institute’s Oscar “Bud” Frazier, a Vietnam veteran and tireless career cardiac surgeon whose specialty was transplantation and the left ventricular assist device. All four—in addition to many others—demonstrated drive and the creative innovation necessary to revolutionize the way heart patients survived and thrived through the development of new techniques and lifesaving devices. Even casually interested readers will become fascinated by Swartz’s vivid depiction of Frazier at work in the operating room. 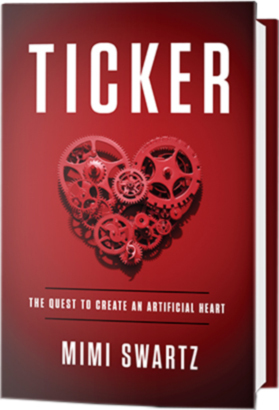 The author also analyzes the evolution of some admittedly dicey medical procedures and mechanical devices like the artificial heart, and she includes details on animal testing, a crucial necessity but no less heartbreaking for pet lovers. “Science isn’t always pretty,” writes the author, “metaphorically or literally.” The author adds breadth and perspective with sections covering the case histories of desperate patients who came to the Texas Heart Institute for medical intervention.